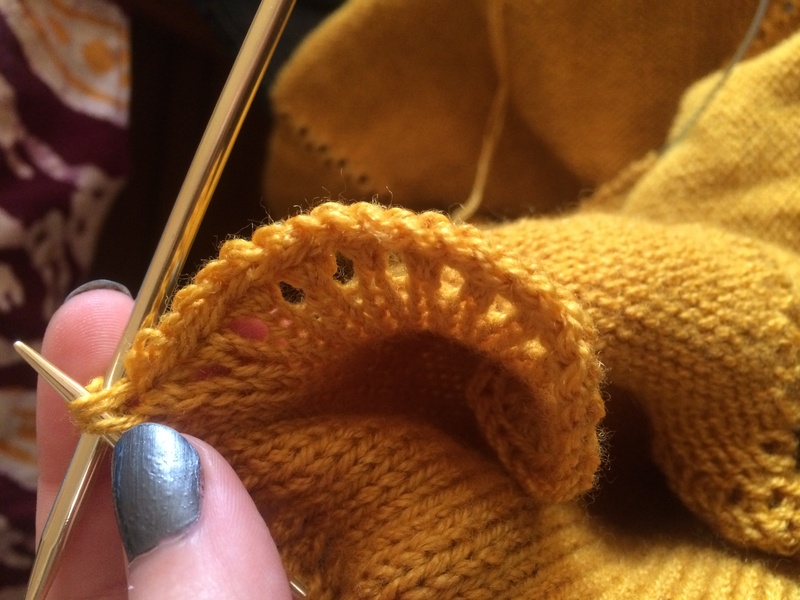 Holly Chayes » Why do you knit? Why do you knit ? I knit because it’s magic. It’s transformation. Turning one thing into another. String into stitches, stitches into fabric, and fabric into a picture. I write because it’s magic. Stringing words into phrases, that communicate ideas, that you can then read, and understand. Linking my brain to yours, using your eyes, my fingers, some pixels, and words as many words as we can get our hands on. I dream because dreams are where acts of magic are born. Why do I knit? One button I found at a knitting store says it is “so I do not kill people!! !” That is true especially when I have the news on!!! It is wiser for me to turn on Martha Stewart or HGTV, and watch something beautiful while I’m engaged in creating something beautiful. Knitting intrigues me because I take “two sticks and a string” and make lovely fabrics that can be worn or snuggled up with. It is amazing to see the variety of stitches and the way the newer designers are graduating one texture into another. How do they think of that!?! I’m amazed. I also like to write, and in the same way the alphabet amazes me. I remember my first grade teacher telling us that we could make any word there was with those 26 letters, and I was fascinated. The same can be said of knitting (and crochet)–that you start with basic stitches and everything else in the craft is a variant of the knit and purl, or the basic chain. Whether I’m knitting, crocheting or writing, the number of possible variations is a real source of wonder. I feel very lucky to have learned to knit and crochet at an early age, and I have to just stop and wonder at it when I’m doing these crafts. They are a true joy. Knitting has 1 stitch, English has 26 letters, both have endless possibilities. I also find that absolutely amazing. Thanks for sharing.